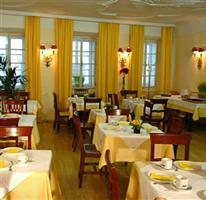 This Salzburg hotel is an historic landmark located in the heart of the Old Town. The Altstadthotel Zur Goldenen Ente Salzburg offers close proximity to several points of interest, including the cathedral, the Getreidegasse, Mozart's birth home, festival halls, and the River Salzach. The [hotelname} is located ten kilometers from Salzburg airport. Many places of interest are within easy walking distance from the hotel. Taxi service and public transportation are available for attractions that are further away. The Altstadthotel Zur Goldenen Ente Salzburg's twenty guest rooms offer satellite television, safes, and complimentary newspapers. The en suite bathrooms are complete with hair dryers and bathrobes for guests' convenience. Beautiful historic touches adorn the Altstadthotel Zur Goldenen Ente Salzburg, which can be traced back to the 14th century. Modern amenities, such as an on-site pub, a restaurant, and a business center are available. Complimentary high-speed Internet is available to all guests in public areas of the hotel. A rooftop terrace is the perfect spot for Happy Hour. Parking is available nearby for a surcharge.